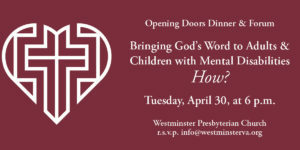 This year Westminster will host the PACEM (People and Congregations Engaging in Ministry) men’s homeless shelter, March 9-23. Based on previous years, we will likely host 40-50 guests each night in Fellowship Hall. This ministry is one of the best ways that we can fulfill our Christian commitment to love all our neighbors. It’s a pleasure to get to know our guests and share time with them. To volunteer during PACEM, click here.